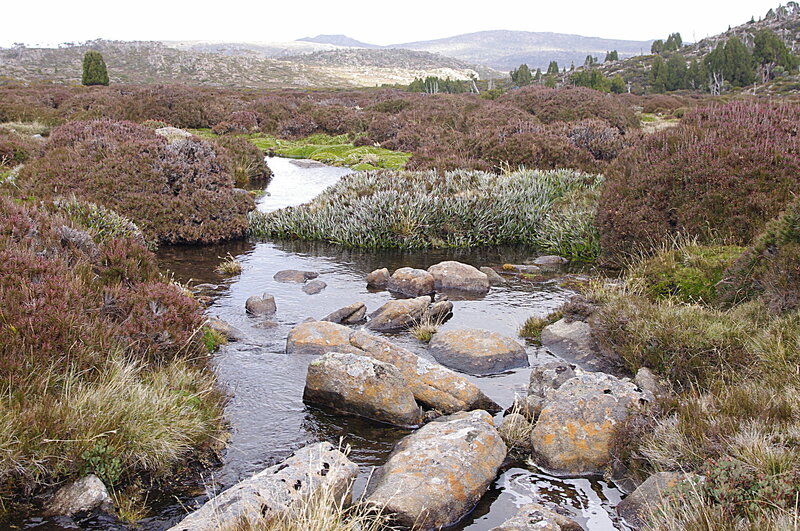 The far north western edge of the Central Plateau feels remote even though it looks out over the farmed plains of northern Tasmania. This is country that I had been looking at for years. 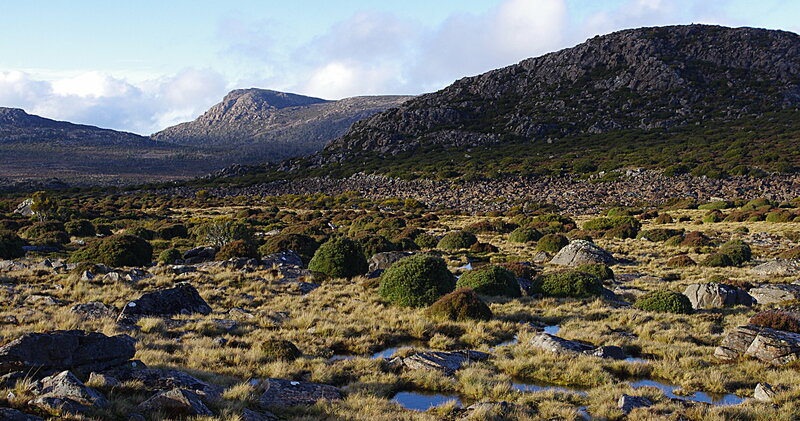 From the Walls of Jerusalem or from the higher peaks in Cradle Mountain park, the far north west corner of the Central Plateau sits as a high border to the mountains, and seems wonderfully remote. 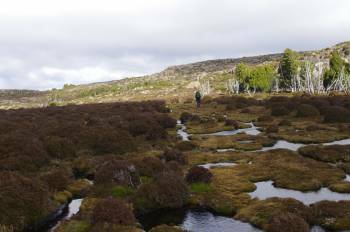 Unlike a lot of the Biblical names in Central TAS, many of the names in this area are beautifully evocative: Lake Nameless, Forty Lakes Peak, Ironstone Mountain. A big part of the appeal for me is the lack of tracks and a big mass of open sub alpine country. Finally I have got out into it, walking from Lake McKenzie to the Long Tarns, then back via Higgs Track and Lake Nameless in mid March 2013. I wondered about whether to write track notes. This is a place that doesn’t feel like it needs more people. For all its wildness, it is incredibly fragile. For a lot of the time we were walking I felt like a vandal, trying to avoid the cushion plants, and with only limited foot traffic you can still see obvious erosion in lots of places …. but it is sublime and magical country. It is part of the most extensive and continuous alpine and open sub alpine terrain in the state. Take care of the place, be mindful of waste and vegetation, and have a great walk. This is suggested as a four day round trip from Lake McKenzie. This is one of the spots on the Plateau where you can start up high rather than having to climb up from a valley. You really need the 1:25,000 Maps Lake McKenzie and Pillans to make this trip. Drive to the Lake McKenzie dam wall, off the Mersey Forestry road. Just before you reach the dam wall, you will see a dirt track on your right, turn here and in 100 metres, stop in the obvious car park near the locked gate. Start walking past the gate along the road, in a few minutes you will see a sign about the area being a fuel stove only area. This is where you will emerge on day 4. Continue a few hundred metres more to a small old quarry. There should be a cairn- turn left here and follow the faint track and cairns, quickly climbing out of the scrubby forest into more open terrain. This is what the next few days will be like – low shrubs, water and lakes, scattered groves of pencil pine. The track is easy to follow, eventually passing Blue Peaks and descending through a boulder field to an un named lake. This is about 2 hours from the car. This area is treeless, and completely open to the weather, and there are various spots to camp, here and along the next lake (Middle Lake). We had strong winds from the NW, so kept walking around the first point to get a more sheltered site, with great views of the sharp point of Little Throne. The open valley under Blue Peaks, filled by lake and moor, made me think of the Scottish highlands. Continue on the faint trail around Middle Lake, and cross the outlet creek. The track more or less disappears here. Just follow your nose, stay fairly close to the lake, passing to the west of Little Throne. There is a nice fairly sheltered campsite just past this hill, up on the left. As you leave Little Throne Lake, head towards the open saddle to the east of Turrana Heights, and veer to the right as you start to climb out of the valley. A small ravine cuts down from the saddle, we found easier walking on the right and nice rock slabs just before the saddle itself. A nice rocky hill is now obvious in front of you, which would make a nice detour, simply marked with its height – 1364 – on the Pillans map (GR 498758). 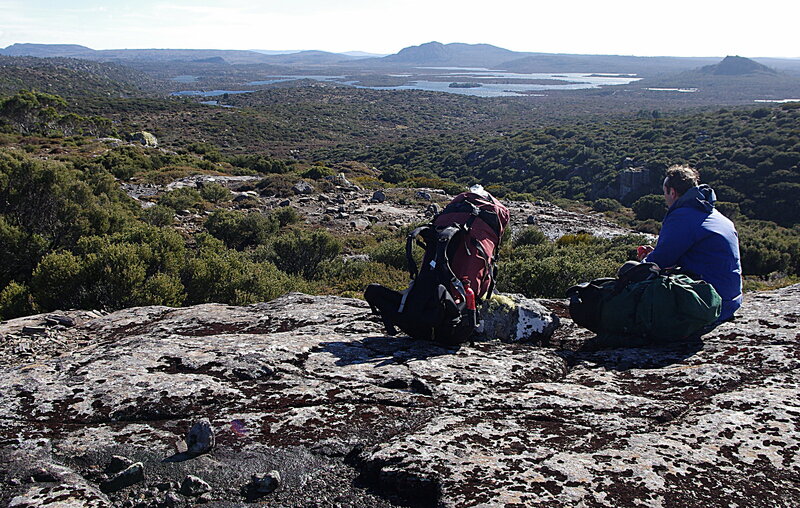 You can continue through the saddle and past the larger lakes beyond to come out at Higgs Track, but from the rock slabs we veered slightly right to gain the ridge line, then on to the summit of Turrana Heights. From here there are fantastic views of Mt Jerusalem and other peaks around the Walls. This is slightly more alpine country, with delightful walking through open shrubs and grasses. Either follow the ridge that leads direct to the summit of Turrana Bluff, or walk halfway along the ridge and cut into the basin under the peak, passing stands of pencil pine and small tarns to gain the southern ridgeline of the Bluff. This avoids about 100 m of vertical climb and probably 1.5km of walking. The views from Turrana Bluff are superb: not only the Walls and flat terrain of the Central Plateau but glimpses into Cradle Mtn NP: Ossa and blocky Pelion West. All the section from Middle Lake is off track. If you camped on Middle Lake, you should be able to enjoy lunch on the Heights or the Bluff. The edge of Turrana Bluff is an impressive cliff line and, beyond that, the deep impression of the Fisher Valley is below you, where a walking track comes in from the Mersey forestry road. Follow the edge of the escarpment in a southerly direction. Long Tarns are in view by now, as is the head of the Fisher valley and Mersey Crag beyond. 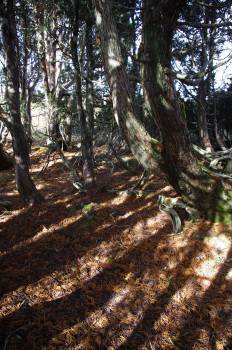 You want to follow the ridge down from Turrana Bluff, heading towards the lower hill in front of you, then skirt right – staying high and passing through some lovely stands of Pine, before emerging in the saddle where Long Tarns drain into the Fisher valley. There are a number of small open camps in the vicinity. The Fisher track is quite easy to find. 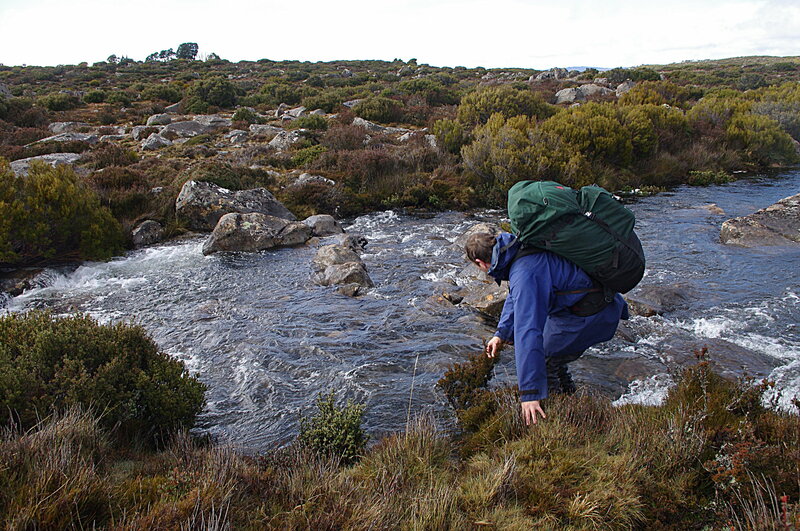 Turn left, travelling along the western side of Long Tarns. 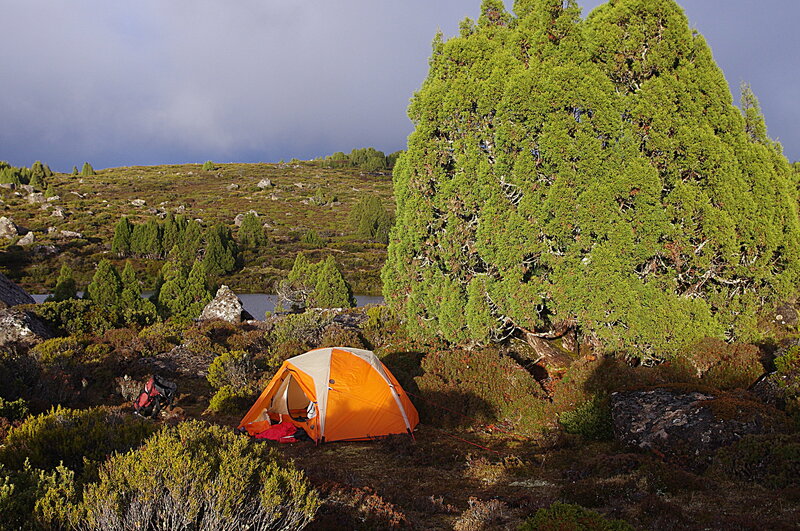 We had bad weather – high winds, rain and snow – so decided to camp early. 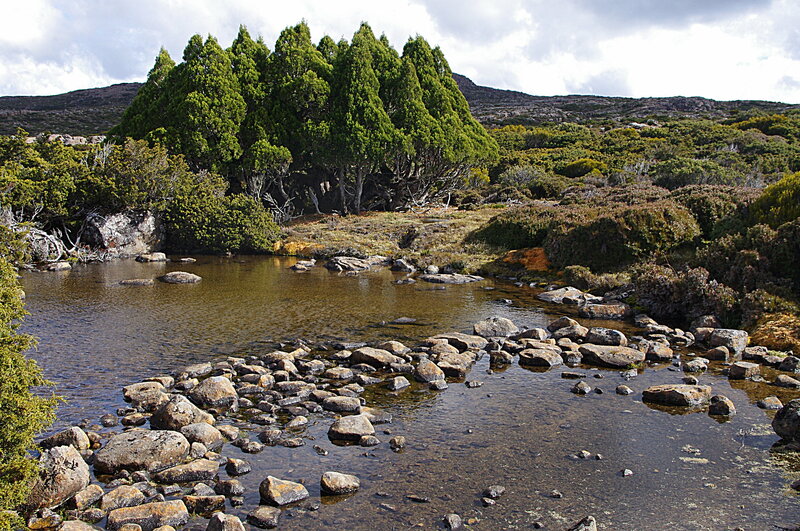 The best spot we saw was in the Pine forest just a few hundred metres from where you start walking on the Fisher River trail, near the start of the Long Tarns, and slightly up on the right along a faint trail. A second option is to continue along until you reach the end of the first long Tarn. Turn right here towards the Pine forest and there are a few small campsites. If the weather is good I would recommend going a bit further, at least to the end of Long Tarns, so the next day is shorter. But be aware that the pine forests end at Long Tarns and you are again in more open country. NB: Having a GPS would allow you to do this walk in poor visibility. We lost the Higgs ‘trail’ a few times and relied on taking bearings off hill 1364 to figure out where we were on a few occasions. Without visibility this would be a much tougher walk. From the end of the first Long Tarn, keep going straight ahead along the narrow and obvious ‘isthmus’, crossing a stream at the end and then regaining the western shore of Long Tarn. The land beyond here tends to be more open, and harder to find sheltered camps. As you reach the southern end of the Long Tarns, the track has turned into a pad, then a rumour… but in a few hundred metres you should hit the Higgs ‘track’. If you reach the next tarns south of Long Tarns you have gone too far. Higgs track is mentioned in various guide books and was blazed in the early 1900s. It’s hard to imagine droving cattle through this area. I wonder if the obvious erosion in various places is a legacy of this practice. The Higgs track is marked by cairns rather than a foot pad, and the pads that exist are often braided. 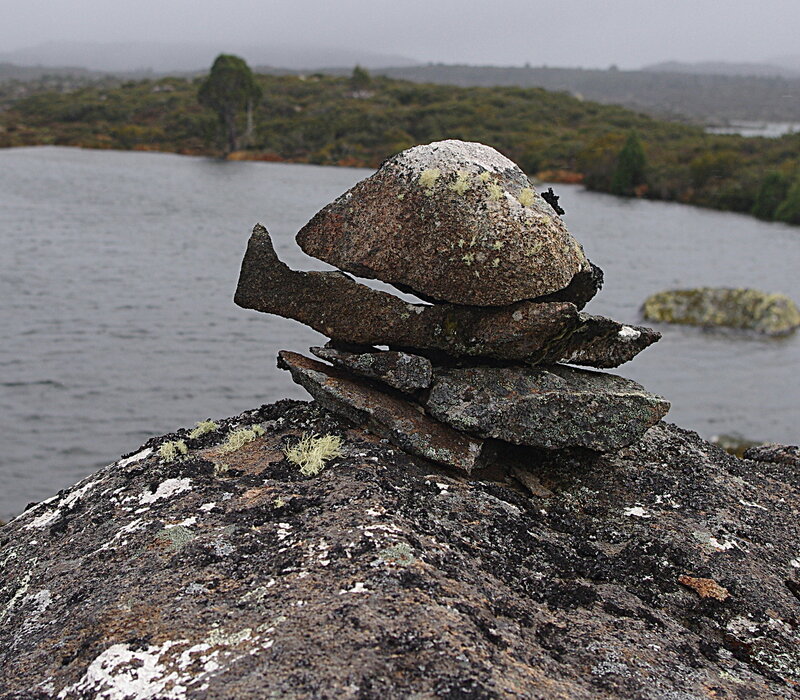 Many of the cairns are elaborate efforts, and covered in sheets of lichen, which at a distance can make them look like boulders rather than markers. We struggled to find the cairns at first and just followed ‘weaknesses’ in the vegetation (which are often animal pads) in the direction we needed to go until we spotted the cairns. The best advice I got from the Chapman/ Siseman guide was that the track tends to avoid the larger lakes like Gwendy, Pencil Pine, etc, and sticks to the higher ground. If you keep this in mind you should be fine. Using a GPS really takes the challenge out of it. When we lost the markers, we would take a bearing off the un named hill (peak 1364), then tried to find a tarn along that bearing to identify where we were. We never got more than 2 km from the peak as we travelled around and past it. 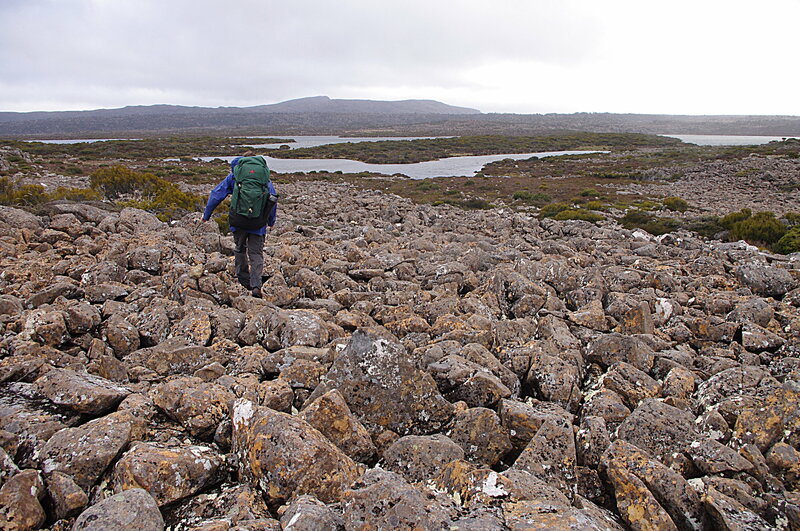 The guide book warns about taking an obvious cairn system that heads off towards Lake Pillans, so when they turned hard right, we kept going straight ahead, following a smaller/ newer set of cairns that quickly disappeared. This may take you to one of the lakes (Gwendy?) that has pine forests and possible campsites. After losing the cairns we kept heading roughly NE, until we were blocked a tarn which we could identify and hence we knew we had to turn right to re gain the Higgs Track. The rough map guide showing Higgs track in the Chapman/ Siseman guide was very useful. It is not marked on the 1:25,000 maps. I found this next section quite well marked, with a more obvious pad, which eventually climbed to a higher ridge where there was a splendid view of Forty Lakes Peak and Ironstone Mountain. If you have time, a quick climb to the highpoint on your east would be good (marked as being 1,315m and located at GR 527768 on the Pillans map sheet). The big valley before you has various lakes, so the trail skirts to the right and is a bit convoluted and easy to lose. But cairns generally do appear if you keep looking. As you pass the valley, climb the slopes of Forty Lakes to emerge in a delightful pass, with a scattering of tarns and Pine. It feels quite alpine again and is one of the most beautiful parts of the walk. We lost the cairns again in the pass (I assume they veer left towards the summit). But we surmised that given it was an old droving route, it would follow the flattest/ most open option, and followed the obvious open grassy lead in front of us, under the rocky little outcrop, and towards Lake Nameless, which provides easy walking almost to the lakes edge. As you get almost to the lakes edge, veer left. 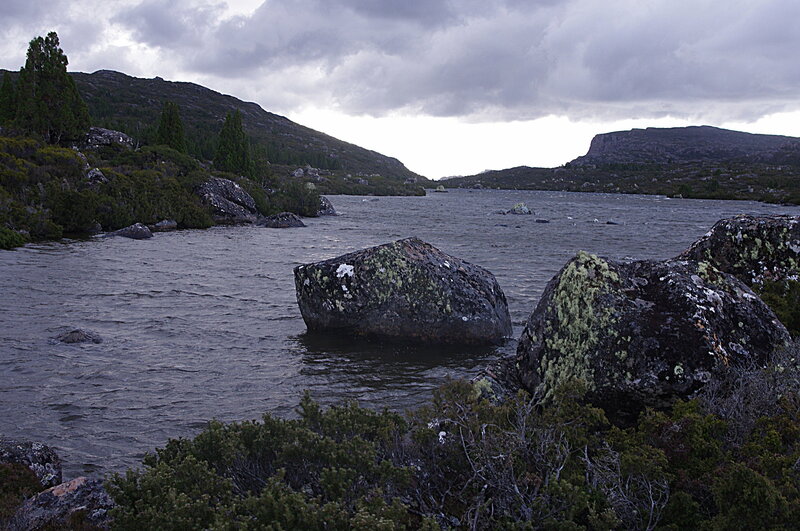 There is a short scramble though a boulder field (explaining why the real trail doesn’t come this way) but in a few minutes you’re out into easy terrain and the Lake Nameless hut will appear slightly above you on your left. The guide says that the track comes in just behind the toilet. Lake Nameless is a small stone hut, rebuilt in 1995. It makes for a great spot to spend the night. 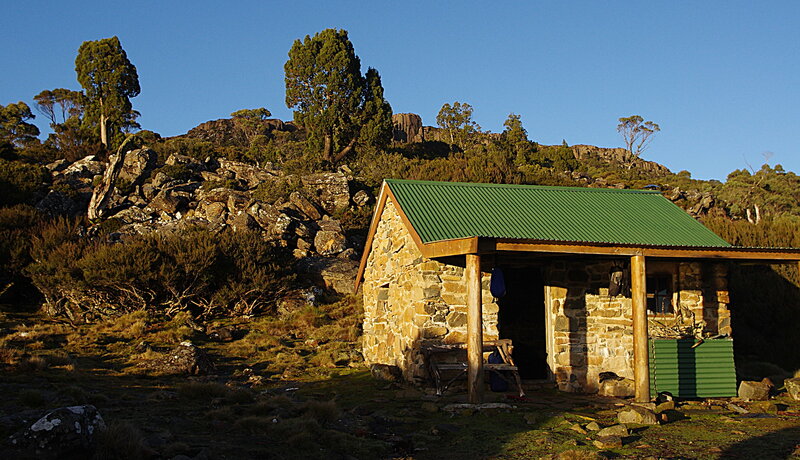 If the hut is already occupied – this area is popular with back country fishers – there is not a lot of great camping nearby. I would suggest continuing another 20 minutes – see the notes for tomorrow. This is a superb spot: a big lake below you, the prow of Ironstone Mountain above you, and stands of Pine and big snow gums. As described (with a camp at Long Tarns) this is probably about 6 – 7 hours of walking. The beginning of the trail from the hut is fairly obvious. Follow it around to the outlet stream, cross over, then turn left shortly after (if you keep going straight ahead you end up at Lake Lucy Long). From the turnoff, the route then becomes harder to follow. Just imagine the shortest line between where the creek comes out of Lake Nameless and the lower end of Lake Explorer lake. Its mostly open country (this is where I suggest camping if the hut is full). After you travel past Snake Lake, the track sometimes gets harder – there are a number of boulder fields – but once you start descending past Explorer Lake it is very well defined. 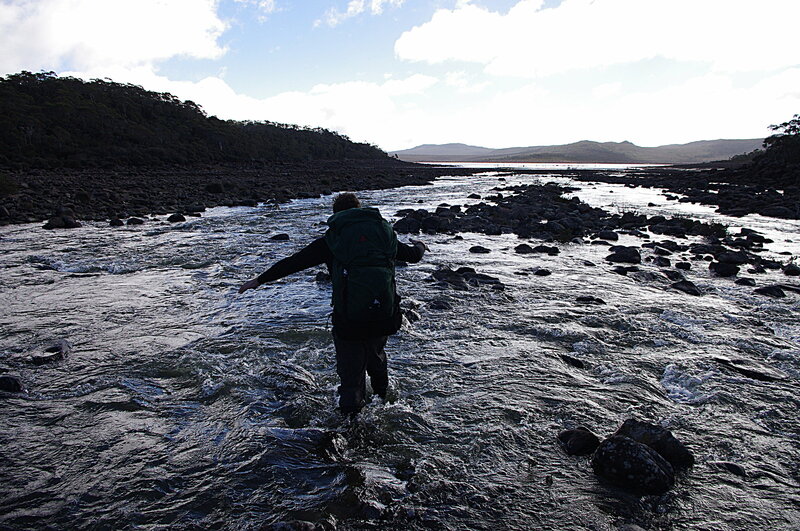 After a few more km, the Fisher River flows in from the left, and you cross Explorer Creek just below where the streams join. This could be tricky after heavy rain. From here, the best bet is to walk along the left hand shoreline of Lake McKenzie and head straight out towards the obvious headland in front of you, and then climb up through the boulders to find an old 4WD trail which runs just along the tree line and takes you straight back to the dam. Cross the dam wall and follow the overflow washout back to the sign from day 1 and the car.